Rohan Palma, the Hajim School study abroad advisor, is an experienced world traveler who took this photo of the Madrid skyline recently while visiting IES study abroad programs there and in Istanbul – “to see what kind of experiences our students have when they go there, to help me better talk to the students from a firsthand experience about what they can expect.” This is the first of two reports on his findings. Nov. 3, 2014—Madrid is now one of the most popular study abroad destinations for Hajim School students – right after Australia and New Zealand – and it’s not hard to see why. 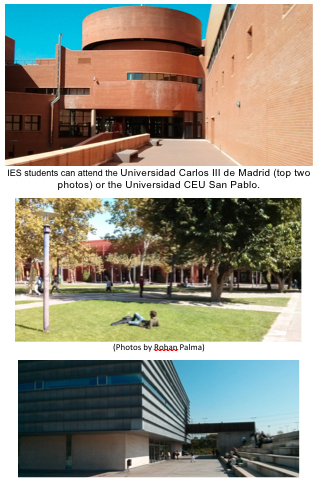 Both universities that IES students attend there — Universidad Carlos III de Madrid and Universidad CEU San Pablo – offer classes in English. Both offer strong engineering programs and both offer classes that have been pre-approved as satisfying UR course requirements for engineering majors. Two are sharing an apartment with two other U.S. students. A companero – the equivalent of an RA – is helping them get connected to the local community and meet people. The third student is staying with an English-speaking Spanish family that provides two meals a day. All three are taking either a basic or advanced Spanish language course so they can take full advantage of culture and educational opportunities. Based on what he saw, Palma heartily concurs. And, he added, it is a great overseas educational opportunity tailored to the needs of Hajim School students. To learn more, contact Palma at rohan.palma@rochester.edu. 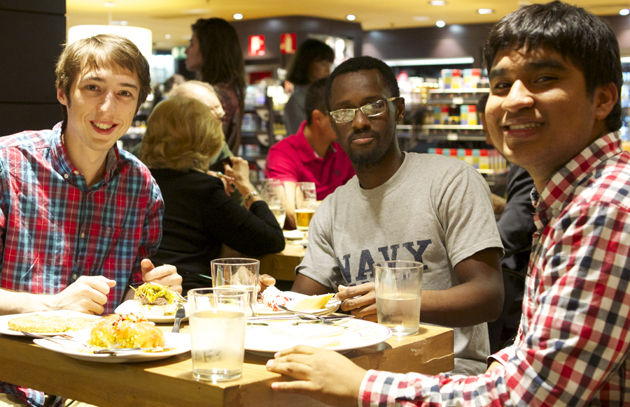 Steven Gattuso of computer science, at left, and Boubacar Diallo, center, and Victor Montano of mechanical engineering are studying in Madrid this semester.